Cooper Piano needed some help. The president and owner Blake Cooper couldn’t do it all and was stressed. He increasingly outsourced components of marketing, from radio advertising and targeted newspaper ads, to paid search and various website marketing efforts. All of this outsourcing had become difficult to keep up with and track. Web marketing changed rapidly. The owner Blake Cooper had trouble staying on top of search engine changes and advances in marketing automation. Blake looked for help. Specifically he needed to understand how his company’s website was doing in producing new business. There were leads coming in from various marketing efforts and outsourced marketing vendors and no way to truly evaluate them. Blake wanted clarity. He wanted peace of mind to know that his marketing was working. Cooper Piano, a retail store that sold and serviced pianos, was a family owned business operating for over 100 years. Cooper adopted website marketing early on (1996) and cultivated a sizable web presence of about 3,000 visits/mo. Although the site didn’t actually sell pianos online in a traditional e-commerce shopping cart way – the site promoted and showcased various piano brands and products, and ultimately helped drive interest and store traffic. By early 2011 the piano industry had experienced tough times. Sales were down drastically. Total units of pianos sold had declined steadily since the late 1970’s. Lower priced keyboards were the only products moving. Blake wanted to focus on selling pianos and running his business. Blake longed for the good old days of leading his excellent sales and services teams with gusto, and with profitability. First, 98toGo installed professional HubSpot and migrated CooperPiano.com web pages onto the automated marketing platform. A big fan of accountability, Blake was able to see the results of the marketing activity from his desktop computer. Next, Cooper hired 98toGo to create consistent content and to generate leads. Optimized blogs were published 3X/week featuring mostly educational content. Customized Calls-to-Action were added the site to engage visitors and to appeal to them at various stages of the buying process. Targeted email marketing bolstered occasional promotions. CooperPiano experimented with blog frequency and with various types of premium offers and versions of Calls-to-Action buttons; the decisions were based on data (actual results). 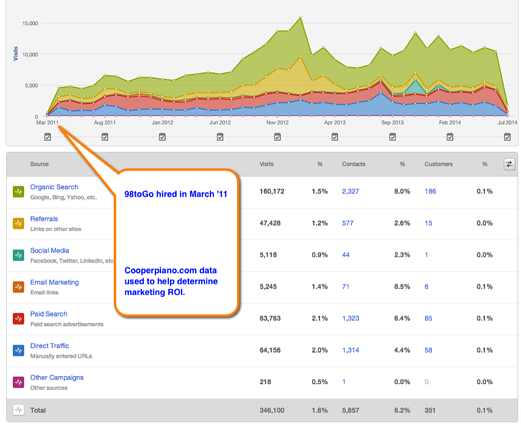 Overall site visits more than doubled, while organic traffic tripled. See graph below. 100+ leads poured in month after month. A 75% higher than average site conversion rate (visitors who become leads) of 1.63%.